Tag line: "So weird! ...So shocking! Do YOU dare see it!" 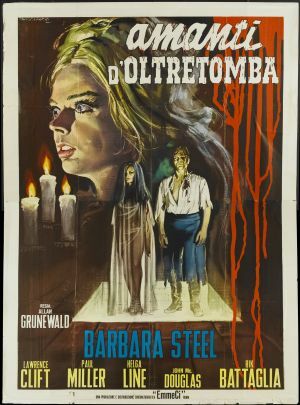 Written and directed by Mario Cauiano, 1965’s Nightmare Castle would have been your standard, run-of-the-mill gothic horror tale were it not for the presence of Barbara Steele. An actress with the uncanny ability to look radiant and frightening at the same time, Steele made a name for herself in the early ‘60s by appearing in films such as Mario Bava’s Black Sunday and Roger Corman’s The Pit and the Pendulum. And like Black Sunday, Nightmare Castle, gives us two Barbara Steeles for the price of one! To punish his unfaithful wife Miriam (Steele), scientist Dr. Stephen Arrowsmith (Peter Muller) ties both her and her lover, David (Rik Battaglia), up in the basement of their spacious mansion, torturing the two before finally finishing them off. Prior to her death, however, the wealthy Miriam informs Stephen that she altered her last will and testament, leaving her entire fortune to her estranged stepsister Jenny (Steele again), who, for years, has been locked up in a mental institution. Eager to get his hands on the money, Stephen seduces Jenny and, before long, makes her the next Mrs. Arrowsmith. Then, with the help of his maid Solange (Helga Line), he tries to break his new wife’s delicate psyche, convincing her that Miriam’s ghost is attempting to contact her. Hoping to have his new bride declared insane, Stephen invites Jenny’s longtime doctor, Derek Joyce (Marino Mase), to spend the weekend with them. But is Jenny truly losing her mind, or does the spirit of Miriam actually wander the hallways, waiting for an opportunity to strike back at her gold digging husband? Much like she did in Black Sunday, Steele plays two separate characters in Nightmare Castle: the heavy (the adulterous Miriam) and the innocent victim (Jenny). What’s more, she’s excellent in both roles, perfectly conveying the passion and hatred of Miriam (despite being close to death, she has a smile on her face when telling Stephen she’s cut him out of her will) and the confusion, as well as the fear, that grips Jenny the moment she sets foot in her new home (her first night there, she has a terrifying encounter with what she believes is Miriam’s ghost). The remaining cast is also effective (especially Paul Muller as the sly Stephen), but Nightmare Castle comes alive whenever Steele is on-screen, and loses some of its pizazz when she isn’t. Like many of these early gothic films, the set itself (i.e. the mansion) is a very important piece of the puzzle, as is the lighting and director’s use of shadows (all of which come into play late in the movie). And while the story itself is nothing new (conniving husband resorting to murder, then trickery to gain access to a large sum of money), these elements, along with Barbara Steele’s exceptional performance, help make Nightmare Castle an above-average horror flick.